1). California Grill Lounge – Another location that celebrates the flavors of California can be found at Disney’s Contemporary Resort. The California Grill is situated at the very top of the Disney Resort and is one of the most popular dining locations in all of Walt Disney World thanks to its incredible cuisine and outstanding views of the Magic Kingdom and World Showcase Lagoon. 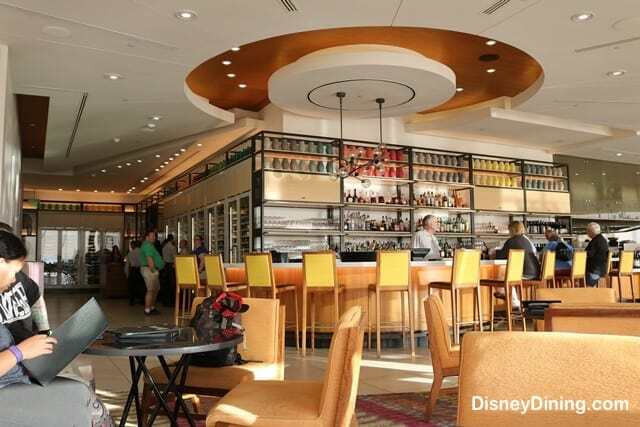 Guests who are planning on enjoying a meal at the California Grill or those who simply want to check out the view can enjoy the ambiance and amazing options at the California Grill Lounge. The cozy area features a modern décor with splashes of color and a peek of that famous view to enjoy. Guests can order from a menu featuring many different wines from California in addition to beer, cider, and specialty cocktails such as the Classic Side Car, Napa Blue Martini, Anaheim Mule, Passion Fruit Margarita, and California Grill Coffee. In addition to the great beverages, guests can also nibble on the Selection of Farmhouse and Artisanal Cheeses which feature five different cheeses with seasonal accompaniments.